If the above image brings a smile to your face, chances are you are a fan of Ron Gilbert's work. Creator of the popular Monkey Island series, Maniac Mansion game, as well as the original Sam and Max; Ron Gilbert is credited in over 25 popular video game titles. He's even credited in the very co-op friendly Diablo II. Ron is currently a creative director at Hothead Games, but is taking a bit of a vacation this fall to deliver the keynote address at the Penny-Arcade Expo. Speaking of Monkey Island, next week launches The Secret of Monkey Island: Special Edition for the PC. The game is a re-creation of the original with completely redrawn graphics, with the option to switch to the original 8-bit art at any time. 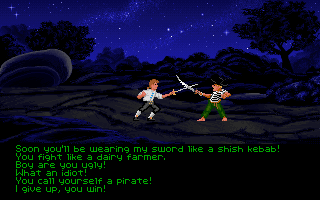 The Secret of Monkey Island: Special Edition should hit the Xbox Live Arcade later this year. We'll have more PAX 2009 coverage for you as well come early September.